The gap is too narrow to see on the graph, but Labour’s poll average for March was 33.5%. The Tories were just 0.1 points behind on 33.4%. Labour’s score is exactly the same as in February. The Tories, by contrast, put on 1.1 points compared with the previous month. Ukip finished March on 14.1%, 0.5 points down on February and a whole point down on January. It’s tempting to conclude the Tories have benefited at Ukip’s expense, but the reality is probably a bit more complicated, with support shuttling around between all the main parties. 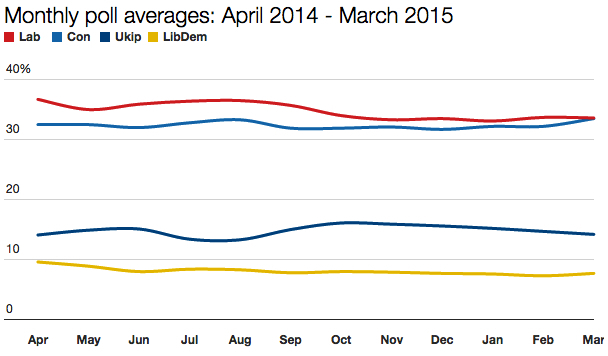 Ukip’s average has been drifting slowly but steadily downwards ever since its peak of 16% in October. There seems to be a squeeze afoot, at least as far as the polls are concerned. Whether this bears any relation to how Ukip will perform on 7 May is impossible to tell, of course. Finally, note that both Labour and the Liberal Democrats appear to have bottomed out and have sunk no further than their respective four-year lows of 33% and 7.5%, both of which occurred in January. Five weeks from today the last opinion polls before the election will be published. My instinct is that they won’t look very different from how they are now. I am inclined to agree that final polls would look much different. I think Con will lead Lab by 3 points and I think LDs will increase to 10% but remain in fourth place narrowly. The SNP never appear in these poll surveys, even though they the third largest UK party by membership and are predicted to win considerably more seats than UKIP. Does this omission make these poll averages meaningless? They’re meaningless only if you try and extrapolate anything from them about the likely election result. In and of themselves, I think poll trends tell their own interesting story.